The hotel has a total of 204 rooms and all of them have a TV, telephone, minibar, shower, hairdryer and a split air conditioner. 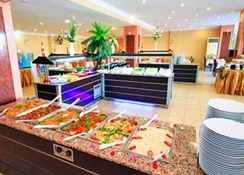 The hotel has also Main restaurant, pool bar, snack bar, pool with slides and kids pool. Free facilities include; mini club, Turkish bath, wireless at loby, table tennis, sunbeds, umbrellas, mattress.Facilities for an extra fee include; billiards, table football, Room service, Doctor, Import drinks, Fresh orange juice, Turkish coffe, Laundry, Safe, Massage. 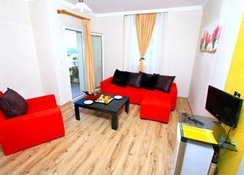 The hotel is 38 km from Airport, 3 km from the Bodrum centre. All activities depend on weather conditions and the hotels may change programms and opening hours without any notice.